Or update! Take your pick. It’s semantics. Take note. 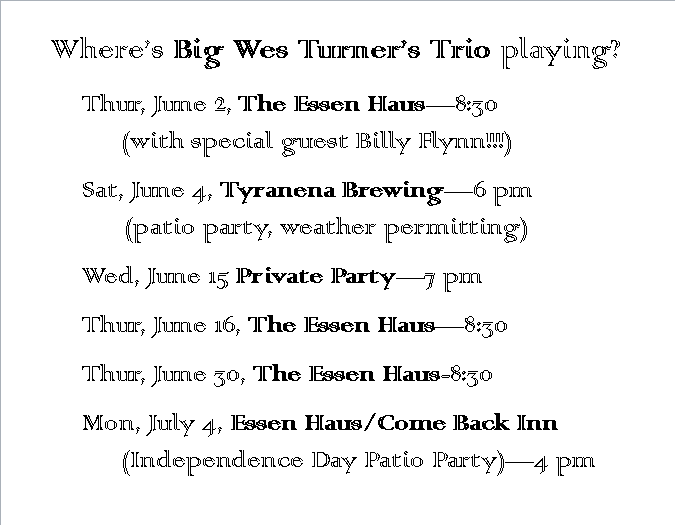 Big Wes Turner’s Trio plays The EssenHaus on the odd Thursdays of the month (somehow appropriate). Next Thursday (June 2), Big Wes guitarist extraordinaire Gary Hendrickson takes one last night off (his post-op knee needs it). Luckily, the amazing Billy Flynn is free to fill in. If you’re a dancer, come and enjoy the dance floor and that crazy Rick Becker beat. If you’re a guitar aficionado, check out Billy’s bottomless bag of licks. Two days later (June 4), the Trio (with Gary Hendrickson, his limp, and his driver) will party on the patio at Tyranena Brewery in Lake Mills. You can come for the band and stay for the beer, or vice versa. Either way, you can’t miss. And about that updated calendar? 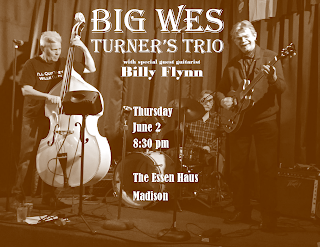 Why do we bother to let you know that Big Wes Turner’s Trio is playing a private party at an undisclosed location in Madison, Wisconsin (on Wednesday, June 15), when you’re not invited? Isn’t that just unusual cruelty? Maybe. 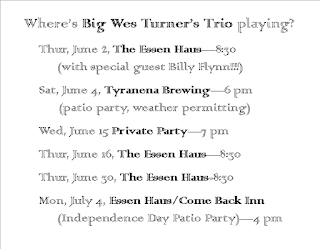 But now you know that Big Wes Turner's Trio DOES PLAY private parties! Big or small, if you've got a party, give us a call.